UPDATE: The strong opposition by the residents and business community of Little Village against the public housing project which Ald. Ricardo Munoz [22nd Ward] wants to build is falling on deaf ears. Munoz, the Alderman for 21 years, obviously doesn't care about the youth in the Little Village community, a predominantly Mexican neighborhood. We must help, protect, and give our youth a safe haven and, to some extent, give them opportunities to do more with their lives. Gang affiliation should not be the only choice, besides too many of our young people in Little Village have been killed because of gang violence. ALDERMAN Munoz has failed to address this issue [gang violence] for the past 21 years. Yes, he has admitted he was a former Latin King which should make this issue a priority for him in his community. Except it appears Munoz cares more about housing; he wants a public housing project in Little Village. But what about the young people who already live in Little Village? As an ex-gang member and Alderman shouldn’t Munoz use his influence and community dollars for a more constructive purpose? The Little Village area needs a youth center, a soccer field or a park for the children and teenagers. Four years ago, Munoz promised the community a park. What happened to that promise? A NEWS RELEASE: Mike Rodriguez, Executive Director of Chicago Enlace organization sent out a news release on Thursday, April 17, 2014 to announce that “Father” Jose S. Landaverde was holding a press conference at 11:00 a.m. to support Munoz's Public Housing project. LANDAVERDE is not a Roman Catholic priest but of the protestant denomination. He does, however, wear a white collar. Out of curiosity, I called Landaverde after the press conference and asked him how many people attended his press conference. “Eleven  people,” said Landaverde. WHAT CRISIS? I have lived in Little Village for 35 years and I have never seen a Mexican person holding up a cardboard sign saying, “I'm Homeless”, or standing on a street corner holding out a styrofoam cup—begging for change. I've never seen a Mexican person in Little Village sleeping on an Ad bench, in a doorway, under a viaduct or on a sidewalk. Why? Because of Mexican pride! It is in our ethnic fiber to work hard and be self-sufficient. Mike Rodriguez's public statements are absurd, ridiculous and, more importantly, misleading! IN LITTLE VILLAGE, there are plenty of houses for sale and plenty of apartments “For Rent”. As I said once before, most Mexicans are homeowners. The Little Village Community Council and HOPE organization advocates home ownership. Home ownership is the real dream of most parents. Parents want their children to have a better life then they themselves have had. This starts with a home and a safe neighborhood. Safety and security are basic concerns of residents and we should all strive to make our community a decent and safe place to live! Bringing in affordable housing is not the way to achieve that goal. I know it, Enlace knows it, and Munoz knows it! 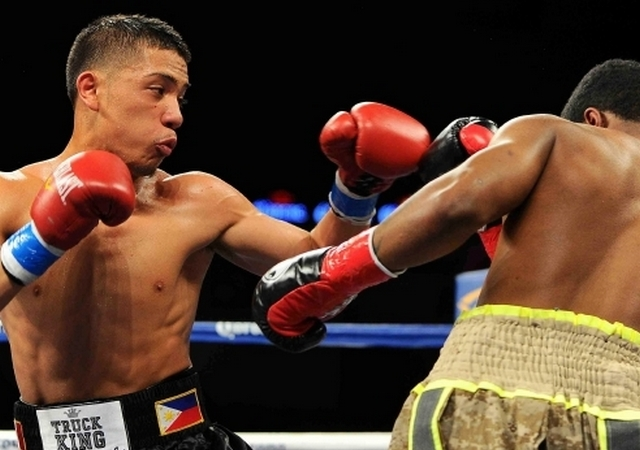 BOXING: Professional boxer Jose Felix Quezada was born January 6, 1995 in Chicago. His parents, Jose and Eileen Quezada, met while his father was overseas in the Marine Corps in the Philippines. He is the youngest sibling of 3, with 2 older sisters. His nationality includes Mexican [paternal] and Filipino [maternal]; proud to represent both. He comes from a boxing family, his father, Jose Quezada, and his uncle, Julian Quezada, were bother boxers. JOSE FELIX graduated from Alan B. Shepard High School in Palos Heights, IL in May 2013. In sport activities he obtained the rank of 1st degree black belt in Taekwondo in 2005 and participated in baseball, football and basketball. He played short-stop with the Merrionette Park Express Travel Baseball Team and the Oak Lawn Chargers Travel Baseball Team. FELIX has over 100 fights in his amateur career. He trains and fights with the Scottsdale Park Boxing Team [Chicago Park District]. At the age of 8, Jose was introduced to boxing and has taken on the boxing ambition. His boxing memorable awards and titles includes State Silver Gloves Champion [3 times]; Chicago Citywide Champ [3 times]; Regional Silver Gloves Champ [2 times]; 2009 Silver Gloves ranked #8 in the 90 lbs. weight division; 2009 National Jr. Golden Gloves Champ. TWO TIMES runner up for the Chicago Golden Gloves and awarded the 2008 Scottsdale Park Boxer of the year. He began his professional career with his first professional fight on February 7, 2014. He won with a TKO in the 3rd round. His boxing record: 2-0 with 2 TKO's. Coach Rick Fornuto said, "Jose is a champ." MEMORIAL DAY: Officers and members of the Manuel Perez Jr. American Legion Post 1017, Mexican American Veteran Association [MAVA] and American Veterans [AMVETS] cordially invite all veterans, families and community to join them on Memorial Day, Monday, May 26th at 10:30 a.m. at the Manuel Perez Jr. Memorial Plaza, 26th St. & Kolin Ave. in Little Village. WEDNESDAY, MAY 21st—Veteran Job Fair in Cicero hosted by Central State SER Cicero Workforce Center, 2138 S. 61st Ct., 3rd Floor, Cicero, IL 60804.